Gauge: dam release plus Coyote inflow (EVA + 45), or Dreamflows. This is an excellent run in October or November when dam operators release water from Pillsbury Reservoir to make room for winter rain and snowmelt. Because of coastal cooling and moderately high elevation, vegetation along this stretch remains verdant all year, so scenery retains a somewhat lush look into late autumn. Proximity to the ocean also makes this area unseasonably warm in winter. It is often quite pleasant as late as the end of November, and sometimes later, even without a drysuit. The only thing to worry about is getting sufficient daylight. 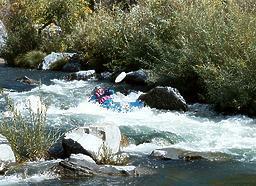 The easiest flow is around 400 cfs. Below that, rocks emerge and make the run more technical. 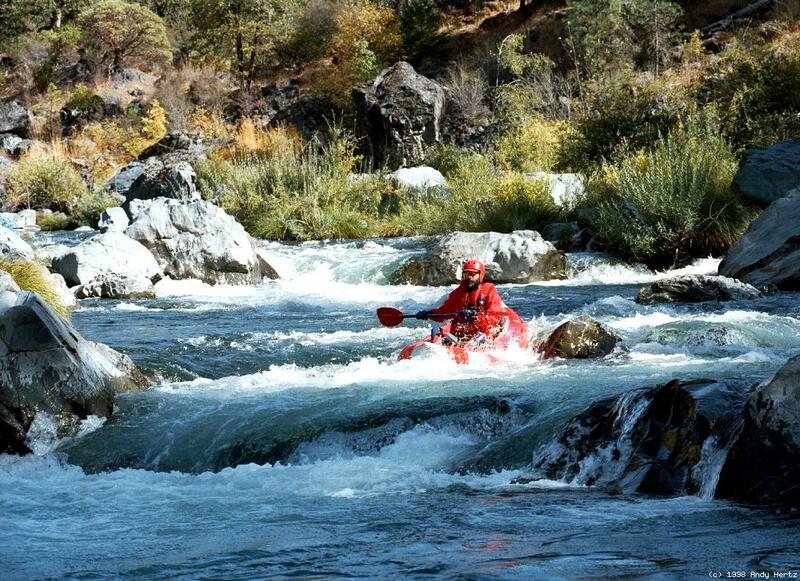 The optimum level for excitement is 800 cfs. Above that level, hydraulics start getting bigger and more threatening. 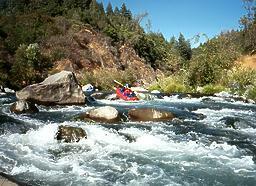 High flows during spring runoff create continuous rapids; swimmers have been known to stay in the river for many miles. Fortunately the release from Pillsbury reservoir, along with the inflow into Van Arsdale reservoir, is available on Dreamflows as of June 2007! For many years this information was missing from the web. During summer, up to 340 cfs of water is diverted from Van Arsdale reservoir on the Eel River to the East Fork of the Russian near Potter Valley. 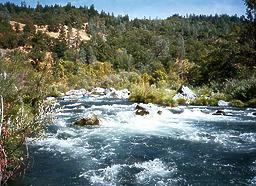 Only about 5 cfs stays in the Eel, greatly harming native fish populations. Steelhead counted at the Van Arsdale fish ladder (at Cape Horn Dam) declined from over 6000 in 1945 to only 5 fish in 1992. One reason for this massive die-off is the absence of a fish ladder on Scott Dam, which impounds Pillsbury reservoir. Elk Mountain Road crosses the river on a concrete bridge. The best put-in is upstream on river right. Several dirt roads lead to the gravel bar under the bridge. Brush along the banks is not much of a problem at low flows, but at higher flows can become dangerous. 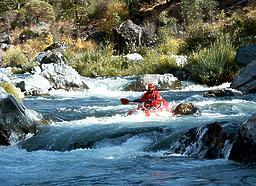 After a short time, enjoyable class II rapids outnumber brushy passages. Benmore Creek enters on the left. 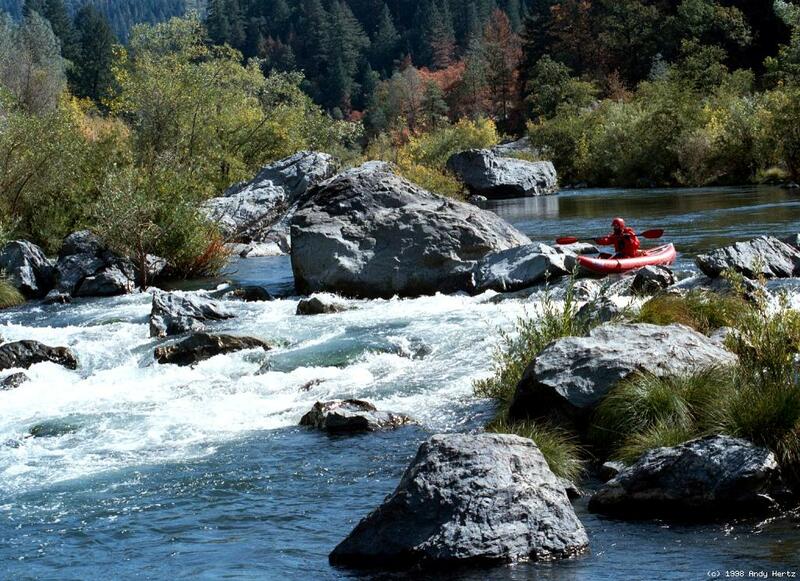 A gravel flat upstream provides plenty of parking and makes another good put-in spot. 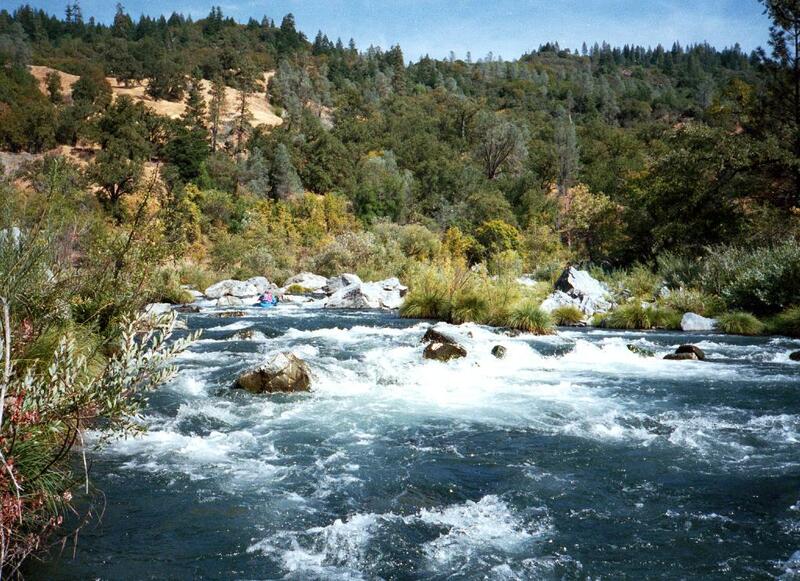 Just after a burnt area on the left bank, class II-III rapids begin. Sharp left turn ahead, and a small mudslide on the right bank. Boulder Bar 1, class III, a long boulder garden with narrow slots between boulders at lower flows, or holes at higher flows. The best route starts left of center, goes right, crosses a short pool, and ends with a drop on the far left. Boulder Bar 2, class III-. There is only a short space between this rapid and the one you just ran. The first drop is a constriction falls, the second drop on the right is a < 1 meter falls into a hole. Except at higher flows, there is a big pool below, where you can walk along a gravel (then rock) beach to look at Dennis's Menace. After a series of drought years, willows grow along the bank here, greatly hindering scouting. Named after Dennis Johnson, a research mathemetician and first descenteur, who urged his boating companions to keep runs secret. Hazard! 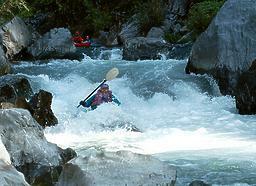 A very large and potentially fatal undercut lurks on the left side above the next rapid. Scout right to avoid this trap. At a constricted passage between a cliff on the left and some house-size boulders on the right, the river drops over a falls, squeezes against the cliff, creating much turbulence, and then drops into a steep crack on the left. Above 400 or 500 cfs, a chute to the right side of a huge rock becomes available, and is the best choice for rafts at higher flows. At flows above 1000 cfs all the drops merge into a large rapid with fearsome holes. In November 1984, hardshell kayaker Sean Smith was killed here when he got pinned on a log that careful scouting would have revealed. Dennis's Menace above the huge rock Emerging upright below the huge rock! Boulder Bar 3, class II+, anticlimactic at low flows, but troublesome at high flows if you come unglued from your boat in Dennis's Menace. 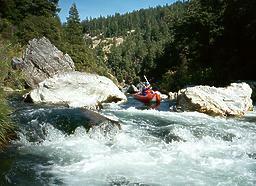 If you have time, consider carrying your boat a short distance upstream to rerun some of these rapids. 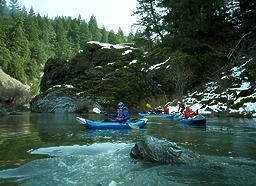 The river enters a wooded canyon, with many fun class II-III rapids. Center Wrap Rock, class III. Some folks consider this the scariest rapid on this run. Rafts often get wrapped around the undercut rock at the very bottom, which is hidden from above. 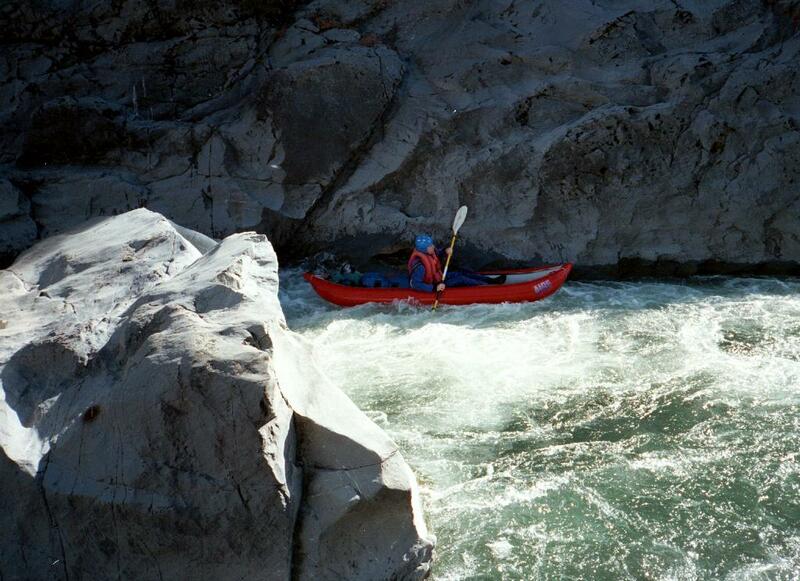 Remain in control and you should be able to paddle left of the undercut wrap rock. 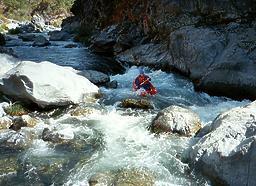 At the end of a pool, the water exits towards the right, over two rocky drops that merge at high flows. At low flows there are two possible routes: left of center involves steeper drops but fewer rocks, while right of center leads into and over some rocks at the bottom. 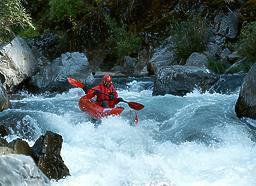 Plastic kayaks usually choose the left, IKs the right. 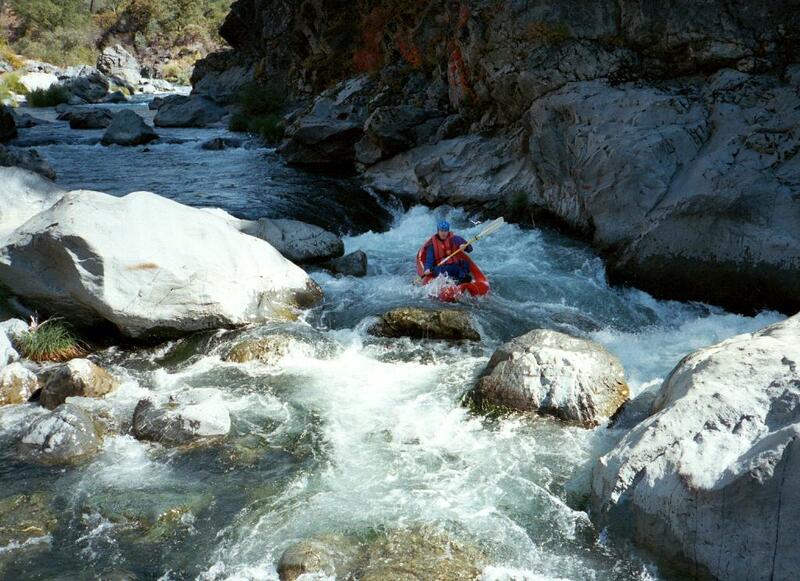 The only problem is that there is no good trail that would ease the task of carrying upstream for a rerun. The river remains in a canyon, and fun class II-III rapids continue. Bucknell Creek enters on the left. A nice gravel beach provides limited parking and makes a pleasant take-out. 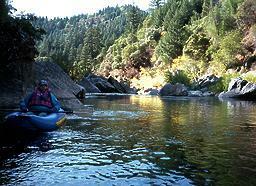 If you are doing a bicycle shuttle, have your bicyclist start here, and roll up or tow the empty boat downstream. Below Bucknell Creek the rapids are much easier. There are many long pools with little current. 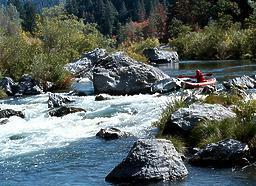 Because the south side road is just above the river, the wilderness feel decreases, although scenery remains excellent. Trout Creek USFS campground on the right bank, alternate take-out if you want a shorter vehicle shuttle. This campground usually closes sometime in September. Eel River Road bridge, accessible but less pleasant take-out on the right bank, just above Van Arsdale reservoir. To reach take-out, turn east onto highway 20 from highway 101 a ways north of Ukiah. After 5 miles, turn north up the east fork Russian towards Potter Valley. After 6 miles, turn sharp right at a country store onto the Eel River Road. Follow this road as it snakes uphill over a divide and descends to the main Eel. Before crossing the river, turn right onto a road (marked closed in 1998) that follows the south side of the river. Continue 3 miles on this dirt road to a concrete bridge over Bucknell Creek. Just before the bridge, turn left down a steep road to a flat spot above the creek and river. Although now blocked by a landslide (1998), the south side road makes the best bicycle shuttle route. The road on the north is longer; it looks on maps as if it should be paved, but it is not. 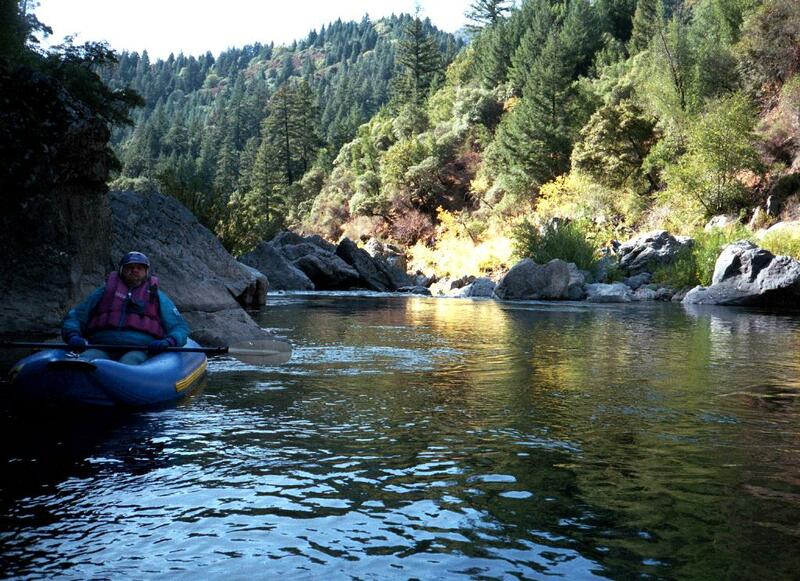 To reach put-in, return downstream to Eel River road, turn right,and cross the high bridge above Van Arsdale reservoir. Continue about 10 miles on the north side road 301, which is paved at first, and then changes to dirt. When the pavement resumes near Pillsbury reservoir, turn right and proceed to the Elk Mountain Road bridge. Vehicle shuttles are available by asking at the Soda Creek Resort store near the intersection of Eel River and Elk Mountain roads. 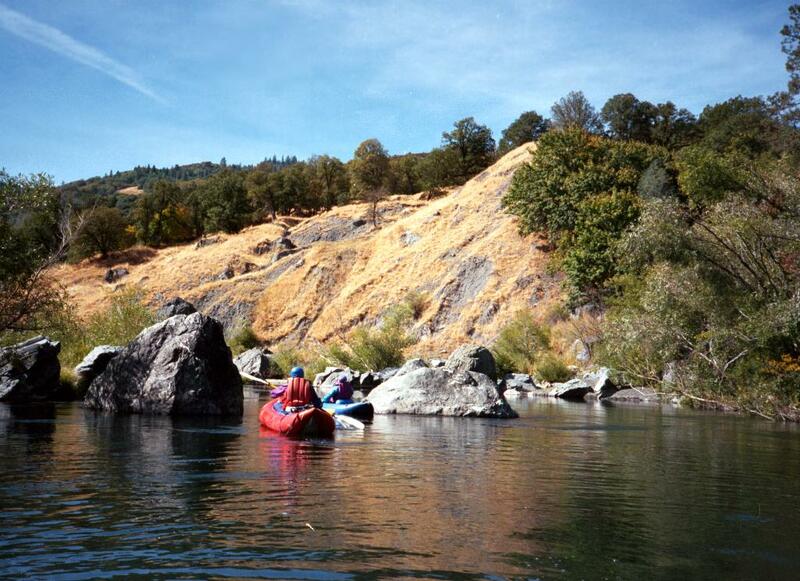 To make advance arrangements, try calling Deboer's Lake Pillsbury Resort at 707-743-1581 (a different resort).